The 2010 Census data is partly out; the Congressional Apportionment data has been delivered to the President. Here in Ohio, we'll be losing 2 seats of 18. (This is unsettling if you live in the 18th district, as we do!) Overall, the "rust belt"--though maybe not as rusty as it was--will be losing nine seats. 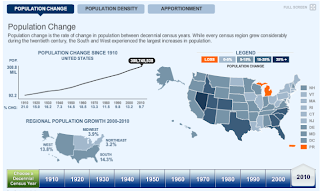 This interactive map shows the population gains/losses in the various states, over the course of the century. Note that the map is still Adobe Flash. Nothing wrong with AS2/AS3, but...a static animation in an uber data-rich site seems a bit 1990's-ish?